100 Laws Worthy of Repeal: A report by Centre for Civil Society, Macro/Finance Group at NIPFP and Vidhi Legal Centre, September 2014. For rule of law to operate, laws must be precise, principles-based, well-written, well-coded and should stand the test of time. The Indian approach has often run counter to the fundamentals of good law-making. Our enthusiasm for legislation has left us with an estimated 3000 central statues, several obsolete, redundant and repetitive. The result is an environment fraught with substantial legal uncertainty, an overburdened judicial system, and pernicious rent seeking. The most important aspect of the Indian development project today is writing sound laws, and then constructing state capacity to enforce those laws. This requires large-scale statutory legal reform. In some areas, there is a need for ground-up rewriting of entire frameworks; in other areas, patient and thorough housekeeping can yield substantial impact. The last concerted effort to clean up the statute books was in 2001. Since then, there has been no systematic weeding of dated and principally flawed laws. 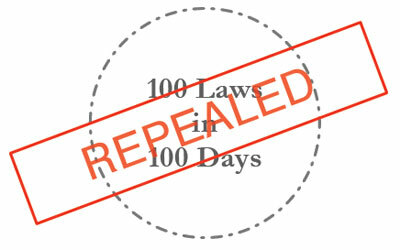 To help the current administration in this goal, we have identified 100 laws worthy of wholesale repeal. These laws should be repealed on account of three reasons—they are redundant having outlived their purpose, have been superseded/subsumed by more current laws, or pose a material impediment to growth, development, governance and freedom. There are over 300 colonial-era enactments in force in India. Many of these are redundant, not implemented, and sometimes even misused. The need for reviewing these old laws has been reiterated time and again. We recommend the repeal of 20 such colonial laws that were enacted to govern situations existing at the time, to cater to British administrative needs, or in relation to territorial areas or official positions of that period. The subject matter of these Acts is now governed by laws enacted post-Independence that are more in tune with contemporary realities. We recommend for repeal 5 laws enacted to manage issues that arose subsequent to Partition, and laws for reorganising affairs in newly Independent India, including the redrawing of boundaries of territories or merger of certain territories with newly formed states. The problems arising out of Partition have been largely resolved, and special laws to deal with the same are no longer needed. In 2001, similar laws were repealed on the grounds that they were ‘redundant, non-functional and ineffective, and have fulfilled their purpose’. We identify 8 laws for repeal that impose levies that are either redundant, or bring little benefit despite adding significant administrative and collection costs. Small cesses and taxes are economically and administratively inefficient and introduce budgetary distortions. These bring in negligible revenue, while imposing considerable regulatory burden on manufacturers. Economists have long argued that doing away with these levies will have ‘little revenue consequence’. From a public finance standpoint, India must do away with inefficient and unsound revenue modalities. We recommend that 20 laws that were passed around the time of Emergency, allowing the government to take over private enterprises be repealed. These Acts provided for the transfer of private assets, rights and interests to the central government. The objective of these Acts was fulfilled once the acquisition was completed. In addition to clearing the books, the repeal of these acts will clear the path towards eventual disinvestment. These laws are a representation widespread suppression of rights and expanding the powers of the state over the national economy during the Emergency era. They have no place in the statute books of liberalised 21st century India. Policy-makers agree that prevalent labour market rigidities in India constrain growth in employment, particularly through onerous laws. There are 44 central labour related statutes dealing with wages, social security, welfare, and occupational safety and health. Of these, we recommend that the government repeal 10. These laws create a network of overlapping regulations, are fraught with inconsistencies, have language that vitiates their intent, or have been superseded by newer laws. In addition, laws on labour welfare cesses and funds have led to administrative inefficiency, imposing high transaction costs but resulting in negligible worker welfare. India ranked 134 out of 189 economies on Ease of Doing Business index. The Indian economy is still held back by the license-permit-quota raj. In order to realise the administration’s target of 8% growth, we recommend that 13 regressive overlapping, archaic, and confusing business and economic laws be repealed. These laws are among the many that stand in the way of India realising its economic potential. Repealing these laws is no silver bullet; in fact some of these are minor irritants. But this will be a step in the right direction—signalling to the domestic and foreign market that Make in India is not just a sentiment, but an active and sincere policy stance. Effective governance typically refers to processes and decisions that seek to define actions, grant power and verify performance. Ineffective governance occurs when there is breakdown in these processes. We have identified 19 administrative laws that hamper good governance by creating avoidable confusion. The recommendation to repeal these laws does not stem from an in-principle disagreement on the subject matter or intentions of the laws. It arises from the poorly worded language, redundant or repetitive content, dated stance and administrative burdens contained in these laws. Article 19(1)(a) of the Constitution accords the fundamental right to freedom of speech and expression. We recommend for repeal 4 laws that violate this constitutional stance, either directly or indirectly, en masse or selectively. These laws define offences in widely worded terms, violate the doctrine of legitimate expectation, perpetrate confusion and ambiguity, and are often used as a tool of harassment. They are left to the arbitrary interpretation of public authorities, and are often misused. Lastly, these laws are repetitive as the offences listed in them are also treated under criminal statutes such as Indian Penal Code and Code of Criminal Procedure. Centre for Civil Society’s iJustice, NIPFP Macro/Finance Group, and Vidhi Legal Centre, with the help of lawyers, legislative experts and economists have identified 100 Laws worthy of repeal to help the administration live up to a key election message. The group recommends for complete repeal 100 laws that are redundant, or materially impede the lives of citizens, entrepreneurs and the government. The Project does not aim to reinvent the wheel. It simply revisits the work and recommendations of several experts before, and provides a clean compendium of low-hanging fruit that can easily be executed with minimal discomfort or encumbrances. The team has developed a one page ‘case’ for each recommendation: The case includes the name of the legislation, Reasons for Repeal, and issues that may need to be taken into account during repeal. Data, testimony, expert recommendations, and previous legal opinion have been referenced and cited. Where possible, Government of India budget and census data and last recorded case filings under each law have been used to reinforce the recommendations. Laws presented in this compendium range from high impact recommendations such as repeal of laws that constrain the business environment, to low impact such as repeal of the laws governing territorial organisation of provinces in the British era. The former set would help put India back on the growth track, and the latter would help clear the statute books of clutter.